Indian tennis players have seen major career overhauls ahead of the upcoming tennis season, although these changes may be short term. World No. 1 Doubles player Sania Mirza, started a strong run of success in 2015 after partnering with Swiss former World No. 1 singles champion Martina Hingis, with the pair winning three Grand Slams and a number of other titles. The two announced a shock split in August 2016, following which Hingis teamed up with American CoCo Vandeweghe, while Mirza partnered Barbora Strycova of the Czech Republic. The Indian’s career, far from declining, has flourished since, with the pair seeing an extremely successful Asian WTA leg after winning the title at the Cincinnati Masters together. Those victories meant Mirza ended 2016 – her second consecutive year – as the top-ranked women’s doubles player despite challenges from Hingis herself. Now, Mirza will team up with American former No. 1 doubles player Bethanie Mattek-Sands for the year-opening WTA tournament in Brisbane, it has emerged. The pair have played together in the past, coming together for a short time in 2012. They had some early success, winning their second tournament together – the prestigious Cincinnati Masters in 2007, but fizzled out afterwards. Playing together in more recent years, Mattek-Sands and Mirza have had wins at Dubai, Brisbane and Sydney – with their pairings in Australia immensely successful. 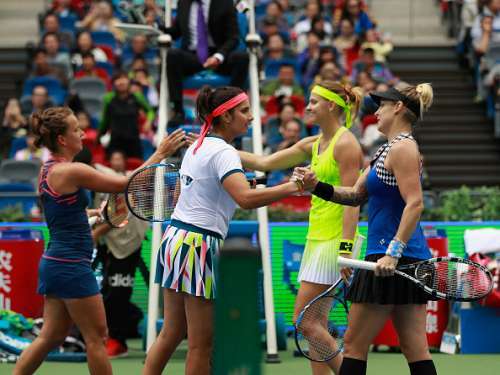 They have played against each other on multiple occasions in the past, and this year Mattek-Sands and Safarova beat Mirza and Strycova for the title at the WTA Motor Dongfeng Wuhan Open in China. To say that Mattek-Sands has had a strong showing with Safarova would be an understament; the pair have had a similar career chart to Mirza and Hingis in their early days, with the Sands-Safarova partnership winning three Grand Slams in addition to a number of other titles; the pair won the US Open this year, beating the successful Caroline Garcia and Kristina Mladenovic. Mirza and Mattek-Sands’ experience playing both with and against each other – coupled with the fact that the pair are known to be friends off the circuit, will add to their partnership at Brisbane. It is not known at this time whether this change will be a permanent one; Mirza has had immense success with Barbora Strycova, while Mattek-Sands has made six finals – of which she has won four – with her own partner, Czech professional Lucie Safarova. The pair finished runners-up at the year-ending WTA Finals in Singapore after a number of title wins. Mirza has won Brisbane with Mattek-Sands in the past, so this could be a strong pairing, if not a very successful one. Given the Sania Mirza – Barbora Strycova pairing has been successful and the pair have had playing chemistry and matching playing styles, it is unlikely the pair have decided to go their separate ways. Mirza has had one-off playing partners during her partnerships in the past, and even in the 2016 season, following her title win with Strycova at Cincinnati, paired up with Romanian professional Monica Niculescu at the WTA Connecticut Open – with the pair winning the title. Mirza is yet to comment. Will India ever produce a Grand Slam champion in singles?